Mr. Mongo loves bubble-wrap. It is like pop-rocks for dogs. It is the chew-toy that pops when you chew it! He enjoys both the small size, which he munches while it makes little pops, and the large Amazon style bubble wrap which he gently carries around until he finally gives in and squeezes it with a big “POP”. Mongo got his notification from the vet that his vaccinations were due. Clearly the vet knows Mongo well. They aimed right for Mongo’s marketing weak spot. 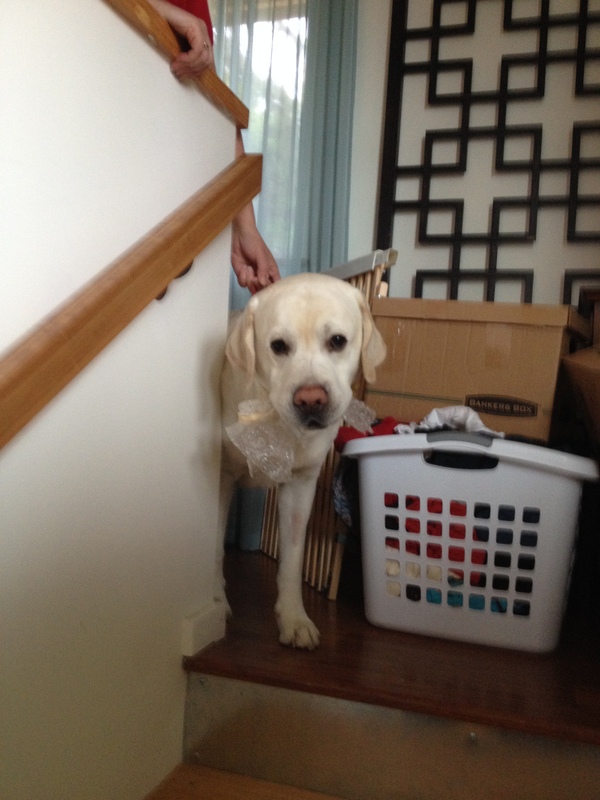 Now Mongo has been counter-surfing in preparation for the Thanksgiving holiday. Dad on the other hand has been cooking. When Dad came down in the morning he found the bag of vegetable scraps from the night before was ripped open and spread out on the kitchen floor. Lying around the bag were just a few bits of pumpkin peel which were supposed to have gone out to the food and yard waste bin. The night before, there had been all manner of pumpkin goop, seeds, and scraps in the bag. Instead of Dad carrying those scraps out for mulching, it appeared that those scraps had been recycled via Mr. Mongo’s digestive tract. But that morning, there was no proof in the “pudding”. However, the next morning, when Dad went out to poop scoop up the back yard, the proof of the fate of the pumpkin scraps was evident. Fortunately, everything passed through cleanly. 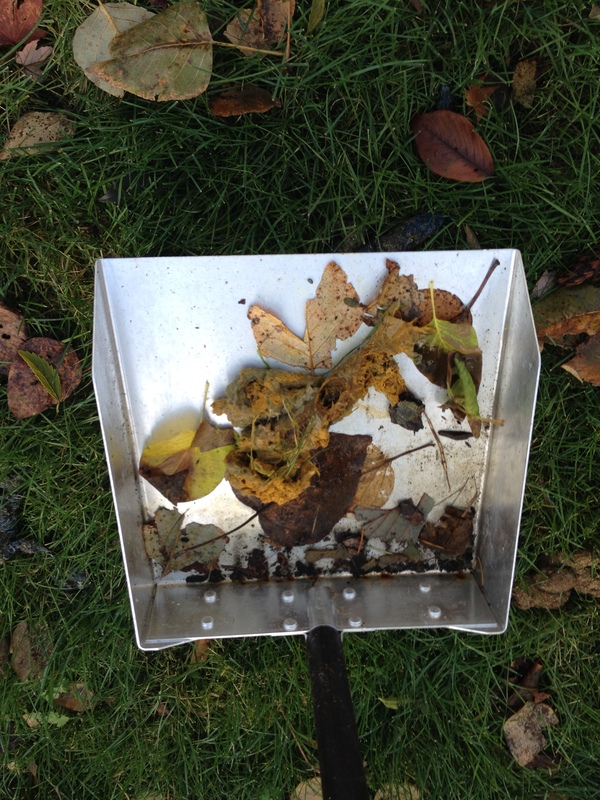 In fact the pumpkin scraps were still bright orange. 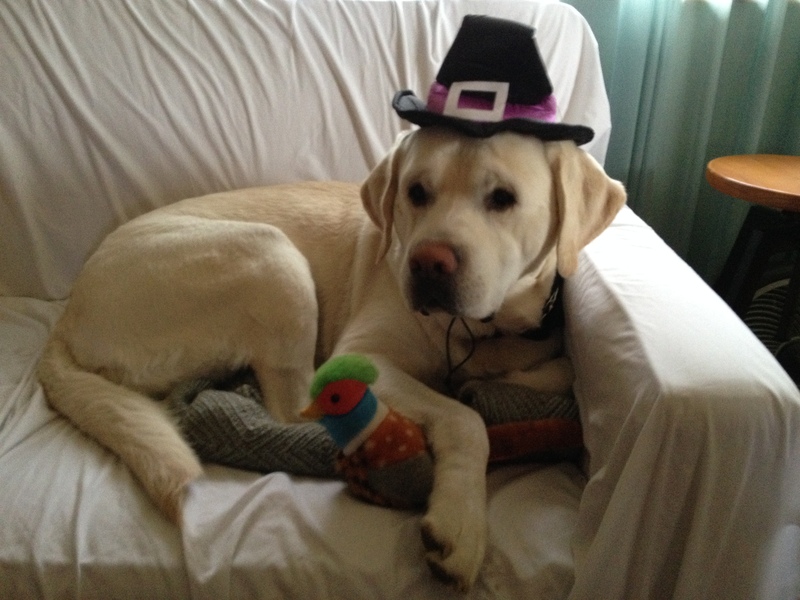 Happy Thanksgiving from Mongo! When faced with a challenge, Mongo is not one to shy away. 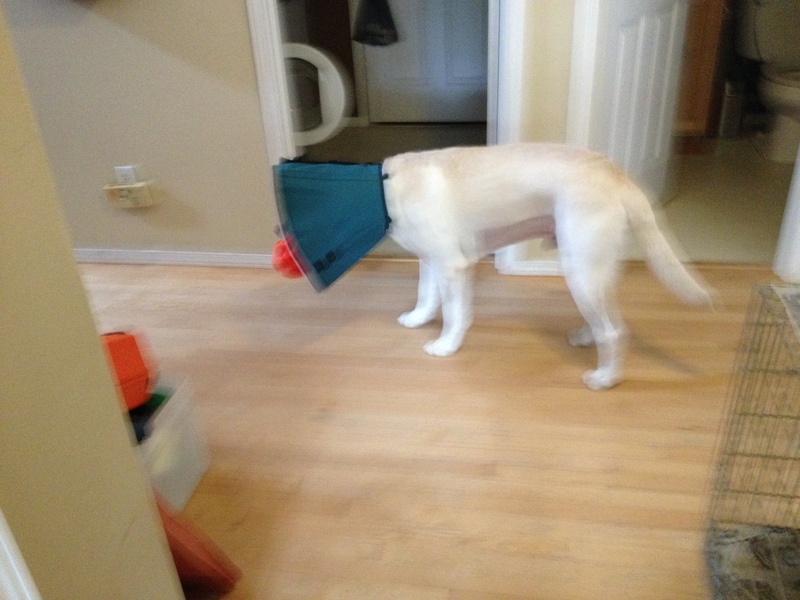 Now that he has to wear the cone of shame, he has to find a way to play with his treat ball. He got his treat ball from the nice people at Pioneer Pet and Feed in Seattle. He loves his treat ball so no mere cone of shame was going to slow Mongo down. Click here <VIDEO> to see his video. Mom-mom and Kimi went to get Mr. M. It turned out that he had eaten a Santa hat off of one of his toys. Mom-mom bought him his own soft-side collar of shame, since if he’s going to be using one so regularly, he might as well have one of his own. Mom-mom and Kimi kindly offered to watch Mr. M, until Dad returned from a business trip. Clearly, Mongo will have to pay closer attention to what’s on his diet if he wants to get any hunting in this year. He will definitely miss opening weekend, and his entry in the Renton K9 Kandy Kane run is in jeopardy now as well. The object did not move overnight. 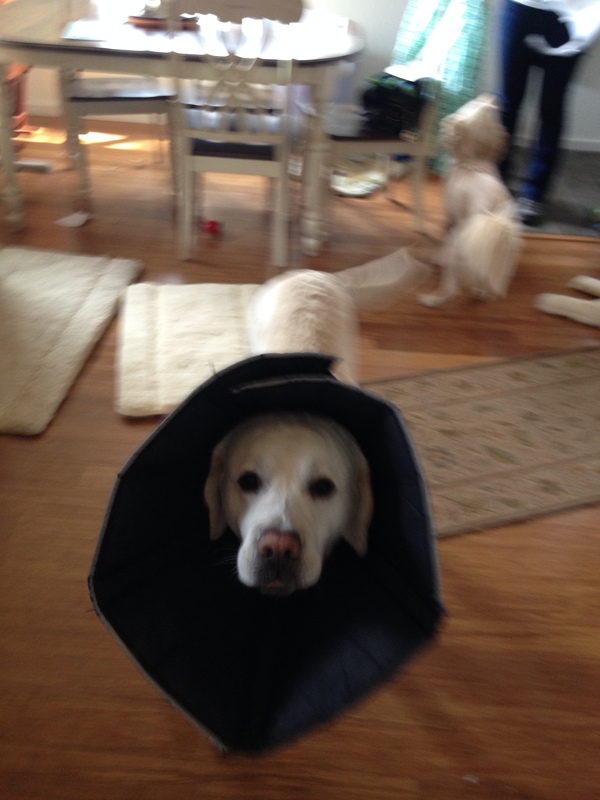 So the next morning, Mr. M went back into surgery. Mongo had eaten something that was indigestible again. After the Sounders win to clinch the Supporters Shield, Dad cam home to walk and feed Mr. M. Dad noticed that Mr. M was not particularly ebullient in his greeting. Then Mongo walked to the park in a lackluster fashion, and then he further moseyed about without doing his business. When they got home, Dad put noms in Mongo’s bowl, but he would not eat. Not pooping was a warning sign. Not eating was a danger sign. Dad took the fuzzy buddy to the emergency vet, yet again. They were very happy to see him, and they remembered him from his last visit on the Fourth of July when he ate the rock. While Kimi and Mom-mom were out at the theatre, Dad waited at Mom-mom’s house for news from the vet. The barium x-rays showed something lodged in Mongo’s digestive track. They would watch him overnight to see if it moved at all. Dad went back to his house to await the news. 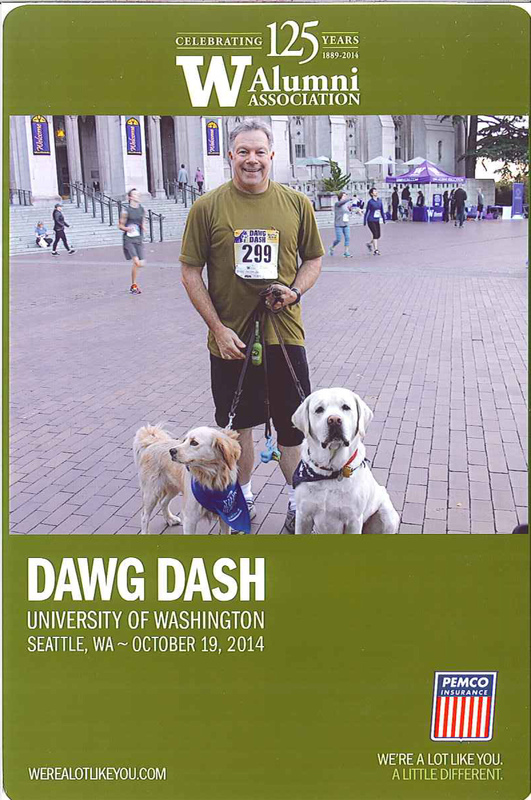 Today was the big Dog Race of the Season in Western Washington – The U of W Dawg Dash. This was Mongo’s chance to outright win a dog race. However, Dad had his doubts about the chances of them placing in this run. The Dawg Dash included hundreds of runners and dogs, and many of them were on the competitive circuit. Dad was just out for fun. It also happened that Dad was dog-sitting Spork for the weekend, while Mom-mom and Kimi went back East. Kimi has assured Dad that Spork was 5k-capable. Still, running the Dawg Dash with two dogs was going to be more of a challenge for Dad than just running with Mongo in the Rover Romp. As part of his strategy, Dad tied both leashes together in the middle, so each dog had about 3 feet to move independently. That seemed like enough room for each of them to maneuver. Time would tell. Dad’s pack started in the middle of the field. It was a much tighter start than the Rover Romp. At the first quarter-mile, Dad and the dogs were still walking. At a walking pace, everything seemed to be going fairly well. The dogs were able to avoid each other, Dad, and the other racers. By the first half mile, things on the course started to open up. As Mongo surged forward, Spork pulled back. The leash skewed across Dad’s legs, leading to some very inventive dance steps by Dad as he tripped, hopped, and skipped over and around the leashes. Dad steered the pack from the course. As they neared the sideline, Mongo decided to move to the outside of one of the light posts lining the pathway. He dragged Spork over with him. Apparently, he wanted to gain a little more room to run. It would not have been a bad idea if Dad had not been on the opposite side of the pole. In a flash Dad saw what was happening, and released the leash, but it was too late. The leash wrapped part way around the pole and then it suddenly whipsawed around the pole. The poo bag holder on the end of the leash got snapped around the pole and flew from the leash handle. Dad watched it arc over the path and winced as it landed on the far side. At least it didn’t hit anybody. Finally, Dad worked the pack off to the shoulder. Once there, Dad untied the leashes to give each dog more leeway. That way Spork could run behind Dad while Mongo ran in front. Reconfigured, the Dad pack reentered the race. As the Dad pack moved back into the flow, the shear density of the crowd intimidated Spork. So with Mongo still pulling for all he was worth, Spork decided the safest place to run was in between Dad’s legs. Dad immediately stepped on Spork’s toes, who yipped, sending Dad skyward in a pirouette of unparalleled beauty and grace. Amazingly, Dad managed to land on his feet and continue moving. He and Spork weaved down the pavement as Spork desperately tried to get between Dad’s feet as Dad tried just as stridently to keep her out from underneath his soles. Finally Spork relented and resigned herself to just running directly behind Dad. So Dad continued on down the course with Mongo pulling his left shoulder forward, and Spork dragging his right shoulder backward. Still, they were moving fairly well considering that Dad’s shoulders were facing the right sideline, forcing him to turn his head 90 degrees to the left so he could see where they were going. With his shoulders sideways, holding one arm in front, and one arm behind, and his head in profile, Dad looked for all the world like a hieroglyph of a footracing ancient Egyptian cruising through the UW campus. Even though Dad and the dogs were lined up single file now, slower people kept sliding back into the leashes. As soon as the people felt the leash on their calf, they would inevitably stop, leading to something like a maypole celebration as the two dogs wrapped themselves about the confused race participant. After coming to a complete stop, Dad would quickly untangle the unwitting pack member, and the pack would race off, as the recent involuntary pack member stared at them with a dazed and confused look on their face. Now that they had a rhythm to follow, the pack stared to make some progress. As they closed in on the finish line, they had enough room around them, and enough experience to move as a unit. They passed the finish line as a furry little triumphirate, but regrettably, not in first place.